Being omnipotent, it's perhaps no surprise that Zeus has more than one online slot to his name. 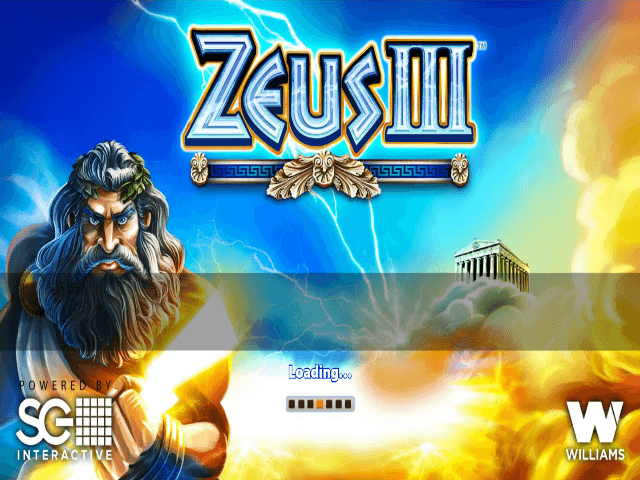 Another foray into the realm of the Greek Gods, this Zeus III slot game by WMS follows the trend of simple but fun games to enjoy, no matter how much you want to bet. It features an interesting reel layout much like Zeus 1000, and if you've played any of the other godly slots featuring the lightning-wielding, white-bearded god-of-gods, then you'll have some idea what to expect with this game, too. Head on through this guide on your Trireme and set sail for big wins. Hopefully. While not as graphically simple as some of the other titles, there isn't too much to write home about visually here, especially compared to some of the more modern video slots. Having said that, the background is nicely done, and the sun rays coming from Olympus are a nice touch as well. The reels themselves are laid out slightly differently than usual, but they're very clear. The symbols will be fairly familiar if you've played any of the Zeus slots before, and they're simply done but make perfect sense. You won't be squinting to see what symbol means what. 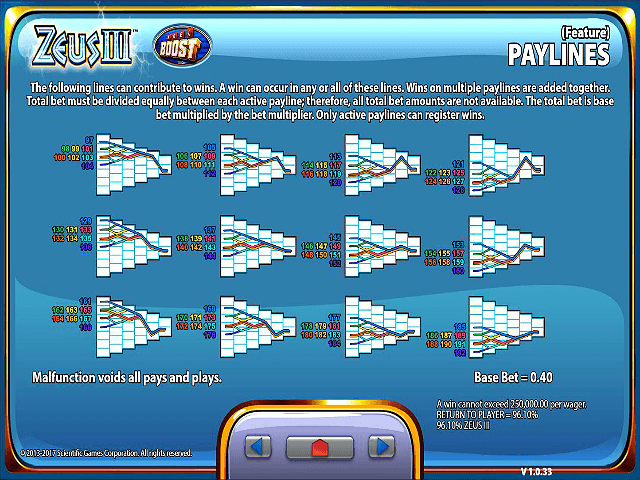 While there are only six reels, the game features a massive 192 fixed paylines. That's a lot, even by WMS game standards. This is where the interesting layout of the reels comes into play. The first reel only has two rows, but each reel adds an extra row, so there's a total of seven rows by the final reel. As usual, the big man Zeus himself is the highest-value standard symbol, so he's the one you want to go for in the basic game to get some payouts. However, if he covers an entire reel, then he also acts as a wild, which is worth keeping in mind. There's only one bonus in this game, the infamous free spins, which we'll look at now. 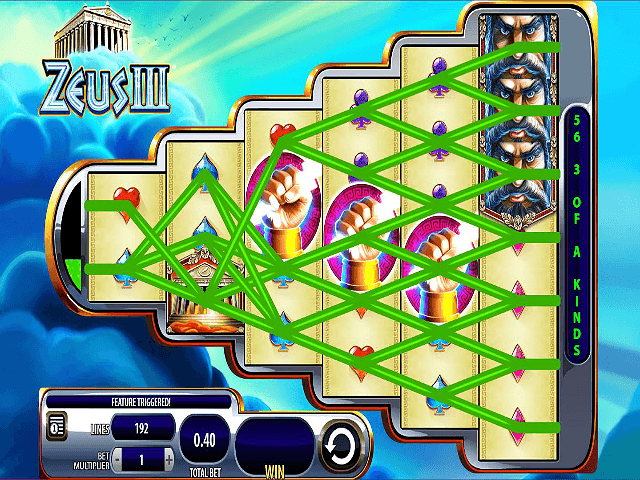 The one thing that made the original Zeus slot so well received was the massive amount of free spins you could get. This title follows in its footsteps to some extent, although there aren't quite as many possibilities for huge amounts of spins. 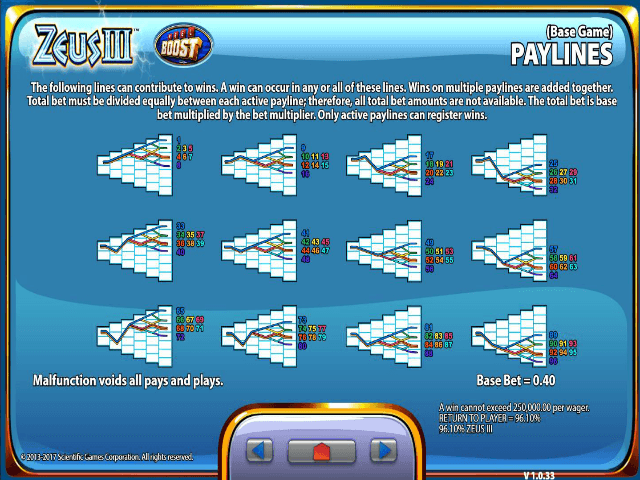 If you can land the lightning scatter on reels two to six, then you'll start racking up the free spins. You can get ten free spins for three scatters, 25 free spins for four scatters, and a pretty decent 50 free spins for five scatters. You might think this isn't as impressive as the 100 free spins you can get in the original, but wait – four and five scatters also give you 10x and a very generous 50x multiplier, respectively. 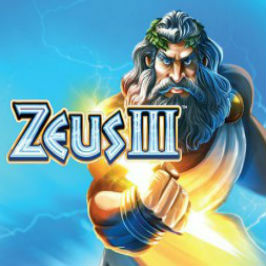 The free spins feature makes the Zeus III online slot a great game if you want to go for those really big wins, and it's simple to play, too. If you like Zeus III - You'll like these slots too!